this chaotic crossroad of hate? on this dark and damned road of Fate . . .
to find where the souls of Demons remain? doubt until at last, your soul, they will gain . . .
dreams that are yours, forever, to adore . . . Since the Beginning, the forces of Light and Darkness have engaged in an eternal war: The Great Conflict, whose victor will rise from the apocalyptic ashes to hold sway over all creation. To this end, the Angels of the High Heavens adhere to strict militaristic disciplines. Seraphim warriors strike at the enemies of Light with swords imbued with righteous wrath and justice. The Angels believe that only absolute discipline can properly restore order to the myriad realms, while the demonic denizens of the Burning Hells hold that absolute chaos is the true nature of all things. The battles of the Great Conflict rage across both time and space, often infringing upon the very fabric of reality itself. From the Crystal Arch at the very heart of the High Heavens to the arcane Hellforge of the Underworld, the warriors of these eternal realms journey to wherever their timeless conflict carries them. The legendary deeds of the heroes of the realms beyond elicit both veneration and insight. The greatest of these heroes was Izual, lieutenant to the Arch-Angel Tyrael and bearer of the Angelic Runeblade Azurewrath. He once led a fierce attack upon the Hellforge as the creation of the dark demonblade Shadowfang was nearing completion. His quest was to destroy both wielder and weapon – a charge that he was destined never to complete. Izual was overcome by the legions of chaos and, tragically, was lost to the Darkness. His fate stands as testament to the fact that Angels and Demons alike shall fearlessly enter into any domain – so long as their hated enemies dwell within. Although the Great Conflict burned hotter and longer than any of the stars in the sky, neither side could gain dominion over the other for long. Both factions sought some way to turn the tides of the war to their favor. With the ascension of Man and his mortal realm, the Great Conflict ground to a mysterious halt. Both armies paused in a breathless stalemate, waiting to see to whose side Man would eventually turn. Mortals had the unique ability to choose between Darkness and Light, and it was held that this would be the deciding factor in the outcome of the Great Conflict. Thus, the agents of the nether-realms descended to the mortal realm to vie for the favor of Man? The coming of the Great Conflict to the mortal realm is known as the Sin War. Angels and Demons, disguising themselves while traveling amongst men, attempted to secretly lure mortals to their respective causes. Over time, the forces of Darkness discovered that mortals responded much more to brute force than to subtle coercion, and so began to terrorize Man into submission. The Angels fought to defend humanity against this demonic oppression, but all too often their austere methods and severe punishments succeeded only in alienating those whom they sought to protect. The violent battles of the Sin War occurred often, but they were seldom witnessed by the prying eyes of Man. Only a few “enlightened” souls were aware of the supernatural beings that walked amongst the huddled masses of humanity. Powerful mortals arose and accepted the challenge of the Sin War, allying themselves with both sides in the Great Conflict. The legendary deeds of these great mortal warriors served to earn both the respect and hatred of the netherworlds. Although lesser demons kneeled before those possessing power and strength, they also cursed the very existence of mortal man. Many of these fiends believed that the deadlock brought about by the emergence of Man was a perverse offense to their “higher” role in the great scheme of things. This jealousy of Man led to harsh, atrocious acts of violence by the demons against the mortal realm. Some men learned of this deep hatred and used it against the denizens of the Underworld. One such mortal, Horazon the Summoner, delighted in summoning demons and then breaking them to his will. 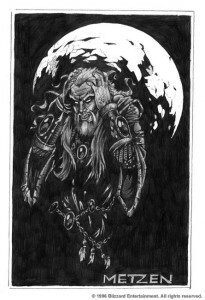 Horazon, along with his brother Bartuc ,were members of the Eastern mage clan known as the Vizjerei. This mystic clan studied the ways of demons and had catalogued their lore for generations. Empowered by this knowledge, Horazon was able to take the work of the Vizjerei and pervert it for his demented purposes. The denizens of Hell sought revenge against this bold mortal, but Horazon managed to keep himself well protected within his arcane sanctuary. Bartuc, the brother of Horazon, was eventually lured to the side of Darkness. 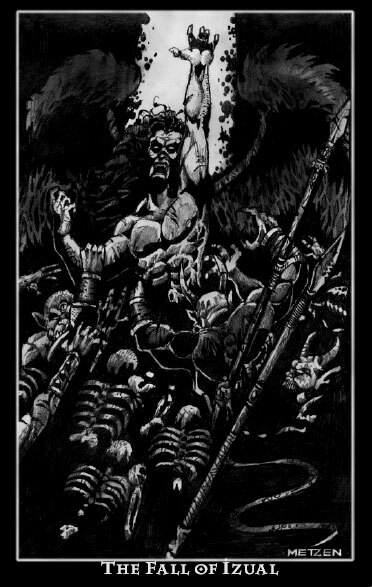 He was granted exceptional strength and longevity, and fought alongside the legions of Hell against the cursed Vizjerei, and eventually his own brother during the Sin War. Although Bartuc was renowned amongst the warriors of many realms, his dominance in battle came with a terrible price. An insatiable lust for mortal blood pervaded his every thought and deed. Bartuc soon became as fond of bathing in the blood of his enemies as he did of shedding it, and in time he came to be known only as the Warlord of Blood. trademarks of Blizzard Entertainment, Inc. Seven is the number of the powers of Hell, and Seven is the number of the Great Evils. These are the true names of the lesser of the Great Evils. For ages uncounted each have ruled over their own domains within the Burning Hells,seeking absolute dominion over their infernal brethren. As the Lesser Four continuously vied for the control of those forces that dwelled within their realms,the Greater Three held absolute power over the whole of Hell. 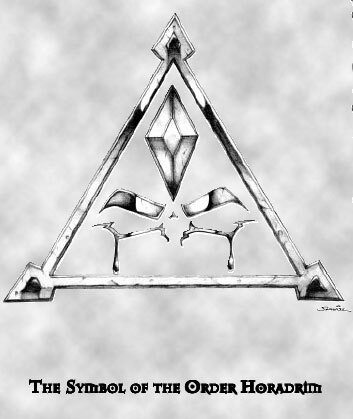 The Lesser Four used dark and evil measures in their quest for power, and herein begins the legend of the Dark Exile. These are the Prime Evils of Hell that wielded their power as a dark, sovereign triumvirate. The Three Brothers ruled over the Lesser Four by brutal force and malicious cunning. Being the eldest and strongest of the Evils, the Three Brothers were responsible for countless victories against the armies of the Light. Although they never held sway over the High Heavens for long, the Three were justly feared by enemies and subjects alike. With the ascension of Man and the subsequent standstill of the Great Conflict, the Three Brothers began to devote their energies to the perversion of mortal souls. The Three realized that Man was the key to victory in the war against Heaven, and thus altered their rigid agendum that they had propagated since the Beginning. This change caused many of the Lesser Evils to question the authority of the Three, and so brought about a great rift between the Prime Evils and their servitors. In their ignorance, the Lesser Evils began to believe that the Three were afraid to continue the war with Heaven. Frustrated by the cessation of the war, Azmodan and Belial saw the situation as their chance to overthrow the Prime Evils and take control of Hell for themselves. The two demon lords made a pact with their minor brethren, assuring them that the wretched plague of humanity would not deter the ultimate victory of the sons of Hell. Azmodan and Belial devised a plan to end the stalemate, achieve victory in the Sin War and ultimately ride the bloody crest of the Great Conflict straight into the very arms of Armageddon. Thus, a great revolution was set into motion as all of Hell went to war against the Three Brothers? The Brothers fought with all of the savagery of the Underworld, and to their credit, annihilated a third of Hell?s treacherous legions. In the end, however, they were overcome by the Horned Death led by the traitors Azmodan and Belial. The Prime Evils, weakened and bodiless, were banished to the mortal realm where Azmodan hoped that they would remain trapped forever. Azmodan believed that with the Three set loose upon humanity, the Angels would be forced to turn their focus upon on the mortal plane – thus leaving the Gates of Heaven abandoned and defenseless. Those few demons who still pledged allegiance to the Three Brothers fled the wrath of Azmodan and Belial, escaping to the realm of Man to seek out their lost Masters. As the war fires died out upon the battlefields of Hell, Azmodan and Belial began to argue over which of them held the higher authority. The pact that they had made quickly fell to ashes as the two demon lords took up arms against each other. The legions of Hell that remained were polarized behind either warlord, launching themselves into a bloody civil war that has lasted to this day . 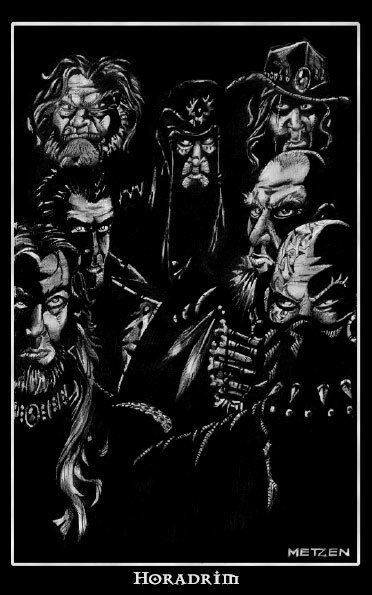 . .
Years after the last of the Horadrim had died, a great and prosperous society grew in the lands of the West. As time wore on, many Eastern pilgrims settled in the lands surrounding Khanduras and soon established small, self contained kingdoms. A few of these kingdoms bickered with Khanduras over holdings of property or routes of trade. These squabbles did little to upset the lasting peace of the West, and the great Northern kingdom of Westmarch proved to be a strong ally of Khanduras as the two lands steadily engaged in ventures of barter and commerce. During this time, a bold, new religion of the Light known as Zakarum began to spread throughout the kingdom of Westmarch and into many of its northern principalities. Zakarum, founded in the Far East, implored followers to enter into the Light and forsake the darkness that lurked within their souls. The people of Westmarch adopted the statutes of Zakarum as their sacred mission in the world. Westmarch began to turn towards its neighbors, expecting them to embrace this ?New Beginning? as well. Tensions rose between the kingdoms of Westmarch and Khanduras as the priests of Zakarum began to preach their foreign dogma whether they were welcomed or not. It was then that the great northern lord Leoric came unto the lands of Khanduras and, in the name of Zakarum, declared himself King. Leoric was a deeply religious man and had brought many Knights and Priests with him that comprised his Order of the Light. Leoric and his trusted advisor, the Arch Bishop Lazarus, made their way to the city of Tristram. Leoric appropriated the ancient, decrepit Monastery on the outskirts of the town for his seat of power and renovated it to match its time-lost glory. Although the free people of Khanduras were not pleased with being placed under the sudden rule of a foreign King, Leoric served them with justice and might. Eventually, the people of Khanduras grew to respect the kind Leoric, sensing that he sought only to guide and protect them against the oppression of Darkness. Not long after Leoric took possession of Khanduras, a power long asleep awakened within the dark recesses beneath the Monastery. Sensing that freedom was within his grasp, Diablo entered the nightmares of the Arch Bishop and lured him into the dark, subterranean labyrinth. In his terror, Lazarus raced throughout the abandoned hallways until he at last came to the chamber of the burning Soulstone. No longer in command of his body or spirit, he raised the stone above his head and uttered words long forgotten in the realm of mortals. His will destroyed, Lazarus shattered the Soulstone upon the ground. Diablo once again came into the world of Man. Although he was released from his imprisonment within the Soulstone, the Lord of Terror was still greatly weakened from his long sleep and required an anchor to the world. Once he had found a mortal form to wear, he could begin to reclaim his vastly depleted power. The great demon weighed the souls residing in the town above, and chose to take the strongest of them – that of King Leoric. For many months King Leoric secretly fought the evil presence that twisted his thoughts and emotions. Sensing that he had been possessed by some unknown evil, Leoric hid his dark secret from his Priests, hoping that somehow his own devout righteousness would be enough to exorcise the corruption growing inside him – he was sorely mistaken. Diablo stripped away the core of Leoric?s being, burning away all honor and virtue from his soul. Lazarus too, had fallen under the sway of the Demon, keeping close to Leoric at all times. Lazarus worked to conceal the plans of his new Master from the Order of Light, hoping that the demon?s power would grow, well concealed amongst the servants of Zakarum. The priests of Zakarum and the citizenry of Khanduras recognized the disturbing change within their liege. His once proud and rugged form became distorted and deformed. King Leoric became increasingly deranged and ordered immediate executions of any who dared to question his methods or authority. Leoric began to send his Knights to other villages to bully their townspeople into submission. The people of Khanduras who had once grown to see great honor in their ruler began to call Leoric the Black King. Driven to the brink of madness by the Lord of Terror, King Leoric slowly alienated his closest friends and advisors. Lachdanan, Captain of the Knights of the Order of Light and honored Champion of Zakarum, tried to discern the nature of his King?s deteriorating spirit. Yet at every turn the Arch-Bishop Lazarus would waylay Lachdanan and admonish him for questioning the actions of the King. As tensions grew between the two, Lazarus charged Lachdanan with treason against the Kingdom. To the Priests and Knights of Leoric?s court, the prospect of Lachdanan committing treason was ridiculous. Lachdanan?s motives were honorable and just, and soon many began question the reason of their once beloved King. Leoric?s madness was growing more obvious with each passing day. Sensing that the advisors of the court were becoming increasingly suspicious of foul treachery, Lazarus desperately sought to contain the eroding situation. The Arch-Bishop masterfully convinced the delusional Leoric that the kingdom of Westmarch was plotting against him, secretly planning to dethrone him and annex Khanduras into its own lands. Leoric flew into a rage and summoned his advisors to his side. Manipulated by the Arch-Bishop, the paranoid King declared a state of war between the kingdoms of Khanduras and Westmarch. Leoric ignored the warnings and admonishments of his advisors and the royal army of Khanduras was ordered to the North to engage in a war that they did not believe in. Lachdanan was appointed by Lazarus to lead the armies of Khanduras into Westmarch. Although Lachdanan argued the against the necessity of the coming conflict, he was honor-bound to uphold the will of his King. Many of the high-priests and officials were forced to travel to the North as emissaries on errands of diplomatic urgency, as well. The desperate ploy of Lazarus had succeeded in sending many of the King?s more ?troublesome? advisors to their certain deaths . . . The absence of prying advisors and inquisitive Priests left Diablo free to assume total control over the King?s battered soul. As the Lord of Terror attempted to strengthen his hold upon the maddened King, he found that the lingering spirit of Leoric fought with him still. Although the control over Leoric that Diablo held was formidable, the Demon knew that in his weakened state he could never take complete possession of his soul as long as a glimmer of his will remained. The demonlord sought a fresh and innocent host upon which to build his Terror. The demon relinquished his control over Leoric, but the King?s soul was left corrupted and his mind crazed. Diablo began to search throughout Khanduras for the perfect vessel to act as his focus, and found such a soul easily within his reach. Enjoined by his dark master, Lazarus kidnapped Albrecht – the only son of Leoric – and dragged the terrified youth down into the blackness of the labyrinth. Flooding the boy?s defenseless mind with the essence of pure Terror, Diablo easily took possession of the young Albrecht. Pain and fire raced through the child?s soul. Hideous laughter filled his head and clouded his thoughts. Paralyzed with fear, Albrecht felt the presence of Diablo within his mind as it seemed to push him down, deeper and deeper into darkness and oblivion. Diablo gazed upon his surroundings through the eyes of the young prince. A lustful hunger still tortured the demon after his frustrating bout for control over Leoric, but the nightmares of the boy provided ample substance to sate him. Reaching deep into Albrecht?s subconscious, Diablo ripped the greatest fears of the child from their hiding places and gave them breath. Albrecht watched, as if out of a dream, twisted and disfigured forms appeared all around him. Unholy, writhing visages of terror danced about him chanting choruses of obscenities. All of the ?monsters? that he had ever imagined or believed that he had seen in his life became flesh and were given life before him. Large bodies comprised of living rock erupted from the walls and bowed to their dark master. The ancient, skeletal corpses of the Horadrim arose from archaic crypts and lumbered off into the red washed corridors beyond. As the cacophony of madness and nightmares hammered its final blow against Albrecht?s shattered spirit, the bloodlusted ghouls and demons of his mind scattered and scrambled maniacally into the lengthening passageways of his waking Nightmare. The ancient catacombs of the Horadrim had become a twisted labyrinth of raw, focused Terror. Empowered by Diablo?s possession of young Albrecht, the creatures of the boy?s own imagination had gained corporeal form. So strong was the terror that grew inside of Albrecht, that the borders of the Mortal realm began to warp and tear. The Burning Hell began to seep into the world of Man and take root within the labyrinth. Beings and occurrences displaced by time and space, and long lost to the history of Man were pulled screaming into the ever-expanding domain. The body of Albrecht, fully possessed by Diablo, began to distort and change. The small boy grew and his eyes blazed as tendril-like spines ripped through his flesh. Great, arched horns erupted from Albrecht?s skull as Diablo altered the form of the child to match that of his demonic body. Deep within the recesses of the labyrinth, a growing power was being harnessed. When the moment was right, Diablo would venture once more into the mortal world and free his captive Brothers Mephisto and Baal. The Prime Evils would be reunited, and together they would reclaim their rightful place in Hell. The war against the zealous armies of Westmarch ended with a horrible slaughter. With the army of Khanduras ripped to shreds by the superior numbers and defensive positions of Westmarch, Lachdanan quickly gathered together those who were not captured or killed and ordered a retreat back to the safety of Khanduras. They returned to find the town of Tristram in shambles. King Leoric, deep within the throes of madness, went into a rage when he learned that his son was missing. After scouring the village with the few guards that remained with him at the monastery, Leoric had decided that the townsfolk had abducted his son and hidden him somewhere. Although the townsfolk denied any knowledge of Prince Albrecht?s whereabouts, Leoric insisted that they had crafted a conspiracy against him, and that they would pay the price for such treachery. The mysterious disappearance of the Arch-Bishop Lazarus left no one in Tristram with whom the King would take council. Overcome by grief and dementia, Leoric had many of the townsfolk executed for the crime of high treason. As Lachdanan and his fellow survivors returned to confront their King, Leoric sent his few remaining guards against them. Believing that Lachdanan was somehow part of the townsfolk?s conspiracy, Leoric decreed that he and his party were to die. Lachdanan, finally realizing that Leoric was beyond salvation, ordered his men to defend themselves. The ensuing battle carried them down into the very halls of the darkened Monastery, bringing a final desecration to the once holy sanctum of the Horadrim. Lachdanan won a bittersweet victory as his men were forced to kill all of Leoric?s deceived protectors. They cornered the ravenous King within his own sanctuary and begged him to explain the atrocities he had committed. Leoric only spat at them and cursed them for traitors against both his crown and the Light. Lachdanan walked slowly towards his King and sorrowfully drew his sword. Full of grief and rage, all honor having been cast to the winds, Lachdanan ran his blade through Leoric?s shriveled, blackened heart. The once noble King screamed an unearthly death-cry, and as his madness finally overtook him, he brought down a curse upon those who had so betrayed him. Calling upon the forces of Darkness that he had spent his entire life combating, Leoric condemned Lachdanan and the others to eternal damnation. In that last, fleeting moment within the heart of the Monastery, all that was ever virtuous or honorable about the stewards of Khanduras was shattered forever.